Dr. Jochmans cites numerous accounts of human artifacts being found in earth strata, which according to the standard evolutionary time scale, predate human evolution. These accounts show human existence far far back into earth history, and prove evolution theory false. Although Dr. Jochmans writes “as though” human remains and artifacts are hundreds of thousands or millions of years old, is it is clear from his conclusion that he considers this world to be young, in accordance with a normal, straight, reading of the Bible and its genealogies. I do not have any background on, nor contact with Dr. Jockman. I cannot contact the “Forgotten Ages Research Society” of Lincoln, Nebraska, USA, which, I understand, originally published the booklet. This booklet was available through the Bible-Science Association some time back. In most of the academic and scientific world today, the interpretation of the history of the earth, of life, of man, and of human culture, is defined within the narrow boundaries of specific, prevailing theories. The geology of the earth, for example, is viewed almost exclusively in terms of uniformitarianism. This means that the present-existing processes of erosion and volcanism are thought to have been the only forces at work in the past. Because of the slowness of these processes of change, and the tremendous transformations observed in the earth’s depths, the age of the earth is thus counted in billions of years – today, it is put between 4 1/2 and 5 billion years. Likewise, the history of life on this planet is seen as a lengthy development by evolution, or, the progression from simple to increasingly more complex forms. Since the simplest – and supposedly earliest – life forms appear in Cambrian rock, and Cambrian rock is dated geologically at 600 million years, this is deemed the age of life on earth. Only in the final stage of evolution did man appear on the scene, the ultimate end-product: According to the most recent anthropological finds, the earliest man-like creatures roamed the earth just 4 million years ago. Finally, the very nature of evolutionary theory dictates that man’s cultural development must have been linear – a slow, gradual, but constant, upward climb from primitive beginnings, spanning the last 10,000 years, with the advent of modern technological civilization and its products the recent culmination of that climb. One of the greatest pitfalls of the uniformitarian-evolution-linear model is that it must accept the premise that man, as an intelligent being, was a very recent arrival in the history of the earth. With the geologic record counted in billions of years, the fossil record in hundreds of millions of years, the record of human fossils in the millions of years, and human civilization only in the thousands of years, there would be no way to explain the presence of human bones, or sophisticated artifacts derived from the hand of man, in deep rock strata. In fact, the finding of even a single such item would be totally devastating to the model, for it would negate the entire concept of uniformity, and the evolution of man and human culture in the past. The point that will be brought out in this book is that there is evidence for man, and the products of human civilization, in the deep recesses of the earth. Herein are presented the case histories. Walk into any natural museum today, or read any textbook on anthropology, and one invariably finds a large chart exhibited, tracing the ancestry of man back through more primitive forebears, until the line is lost somewhere amid the apes. Recently, paleoanthropologist Richard Leakey, excavating in Ethiopia, announced the discovery of what are supposed to be the oldest accepted fossil remains of man – about 4 million years old. What has been disturbing about the new finds is that they are, in part, too human: Their great age, yet partly “modern” appearance, has forced evolutionists to push back the departure of man from the ape stock farther into the past, so that now it is beginning to infringe upon the time period necessary for the development of the apes themselves. But while the African finds are revolutionary, there have been other discoveries of human fossils greatly more important, but these have been deliberately neglected or denounced, because they are far older than man is “supposed” to be. Over a hundred years ago, in the 1850’s, gold miners began digging tunnels into the sides and top of Table Mountain, northwest of Needles, California. Gold was discovered, but along with it were bones of extinct mastodons, mammoths, bison, tapirs, horses, rhinos, hippos and camels – all dating from the Pliocene. In 1863, a physician from nearby Sonora, Dr. R. Snell, began to collect specimens from the excavations. In that year, with his bare hands, he loosened from among the fossils a stone disc that appeared to have been used for grinding. But Dr. Snell was not the first, or last, to unearth mysterious objects from the mountain gravel: In 1853, Oliver W. Stevens made affidavit that he removed a large stone bowl from the lowest level tunnel; in 1857, the Honorable Paul Hubbs, of Vallejo, dug up part of a human crania from inside the Valentine shaft; and in 1862, Mr. Llewellyn Pierce also signed affidavit that he had found a stone mortar 200 feet in from the mouth of the same shaft. The most dramatic find, however, was reserved for a Mr. Mattison, one of the owners of the mines. In February of 1866, Mattison unearthed from beneath a layer of basalt an object which – because of the encrustation’s – he first thought was the petrified root of a tree, but on closer examination discovered was a complete human skull. The miner sent the skull to the office of the State Survey in June of the same year. Eventually, the skull came into the possession of Dr. L. Wyman, of Harvard College, who removed the encasing material around the cranium. Dr. Wyman, and an associate named Professor Whitney, identified the skull as very modern in type, but also noted that, “the fragments of bones and gravel and shells were so wedged into the cavities of the skull that there could be no mistake as to the character of the situation in which it is found.” The stickler was, however, that this meant the skull, along with all the artifacts found, were 12 million years old. In 1958, Dr. Johannes Huerzeler, of the Museum of Natural History in Basel, Switzerland, unearthed a human jawbone at a depth of 600 feet, in a coal mine in Tuscany, Italy. The bone had belonged to a child, between the ages of five and seven. Though flattened like a sheet of iron, the jaw was declared by several experts to be not only human, but modern-looking at that. But what mystified them was that it had been encased in a Miocene stratum – geologically dated at 20 million years. Dr. Huerzeler declared it to be the world’s oldest man” – but his fellow anthropologists did not dare give it the same distinction. Here were human remains more modern in appearance than all the “ape-men” forms ever found – yet they were five times as old as any of them. In fact, the jaw bone is as old, if not older, than many ancestors of the apes. The bone raised more problems than answers – so the find was quickly “shelved,” and no further work was ever done to give it due recognition. Early in November of 1926, archaeologist J.C.F. Siegfriedt made a discovery in another mine, this one the Number Three shaft of the Mutual Coal Mine of Bear Creek, 55 miles southwest of Billings, Montana. What Siegfriedt found was a human tooth, in which the enamel had been replaced by carbon and the roots by iron, by seepage petrification. In an account published in the Carbon County News and dated November 11, 1926, Siegfriedt reported that he had meticulously preserved the mineral matrix that had been deposited around the tooth, and several dentists identified the mold created as being a human second lower molar. The tooth, however, came from the lower level of the mine – from an Eocene deposit dated at 30 million years old. Siegfriedt could generate no interest in his find among other specialists, and as far as is known, no one has done any further study of the mystery. One of the more controversial of the “out-of-place” bones from extreme antiquity is today part of the collection of the Freiberg Mining Academy in West Germany. It is a poorly preserved human skull, found in brown coal in 1842, from an undisclosed locality. Early European authorities dismissed the skull as a fake, but more recent research and analysis has questioned this hasty pronouncement, putting it back into the realm of the authentic. The reason for its initial denunciation is understandable: The coal it was embedded in, a portion of which still clings to the skull, is estimated to be as much as 50 million years old. A week later, Ottinger returned to the plateau with Dr. J.P. Marwitt, professor of anthropology at the University of Utah in Salt Lake City, several photographers, a news reporter, and a number of observers. With cameras recording the event, Dr. Marwitt carefully removed the lower halves of two human skeletons. The bones were articulated – that is, laid out naturally – showing the bodies had not fallen or been washed into the stratum in which they were situated. These and other factors revealed the bones to be as old as the layer in which they were found. The one problem was, the layer is Lower Dakota and Upper Morrison formations -over 100 million years of age, according to uniformitarian geologists. Yet, as Marwitt noted, the bones were not simian or even half-ape: They were fully human and modern-looking. The skeletons were taken by Marwitt back with him to the University of Utah, to run laboratory datings on them. But whether the tests were ever run, there was no official confirmation. One gets the impression they were, and that the findings were too disturbing for conservative thinking. Marwitt suddenly became “disinterested” in the project, and left Utah to take up a teaching position elsewhere. After a year waiting for results, Ottinger recovered the bones – and that ended the scientific inquiry. At times, the discoveries made revealed “mysteries upon mysteries.” In July, 1877, four prospectors were looking for gold and silver outcroppings in a desolate, hilly area near the head of Spring Valley, not far from Eureka, Nevada. Scanning the rocks, one of the men spotted something peculiar projecting from a high ledge. Climbing up to get a better look, the prospector was surprised to find a human leg bone and knee cap sticking out of solid rock. He called to his companions, and together they dislodged the oddity with picks. Realizing they had a most unusual find, the men brought it into Eureka, where it was placed on display. The stone in which the bones were embedded was a hard, dark red quartzite, and the bones themselves were almost black with carbonization – indicative of great age. When the surrounding stone was carefully chipped away, the specimen was found to be composed of a leg bone broken off four inches above the knee, the knee cap and joint, the lower leg bones, and the complete bones of the foot. Several medical doctors examined the remains, and were convinced that anatomically they had indeed once belonged to a human being, and a very modern-looking one. But an intriguing aspect of the bones was their size: from knee to heel they measured 39 inches. 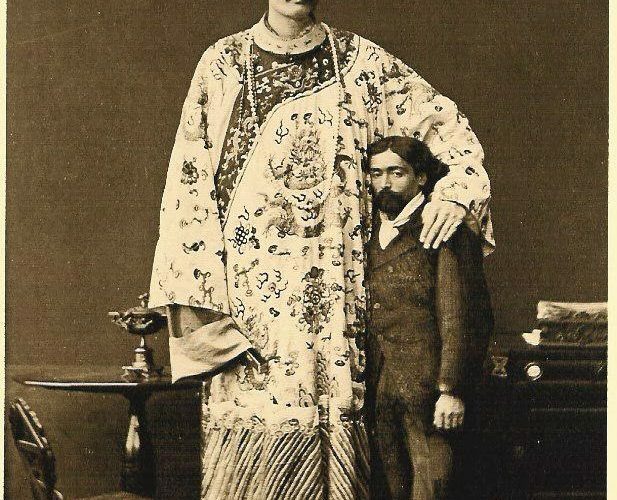 Their owner in life had thus stood over 12 feet tall. Compounding the mystery further was the fact that the rock in which the bones were found was dated geologically to he era of the dinosaurs, the Jurassic – over 185 million years old. The local papers ran several stories on the marvelous find, and two museums sent investigators to see if any more of the skeleton could be located. Unfortunately, nothing else but the leg and foot existed in the rock. The next and last skeletal find takes us another quantum leap in geologic time, and plunges us even deeper into the earth’s strata. A Scientific American article published in 1880 reprinted the particulars of a discovery made in the spring of that year, reported in the St. Louis Republican. Dr. R.W. Booth, who operated an iron mine about 3 miles from Dry Branch, in Franklin County, Missouri, unearthed from a depth of 18 feet a human skull, portions of ribs, vertebrae and a collar bone. With them were two barbed arrowheads of flint, and pieces of charcoal. Dr. Booth realized the significance of all this, but was frustrated when at just a touch the skull crumbled to dust, and the other bones likewise broke into pieces. But these pieces nevertheless told their story: Later analysis showed they were definitely human. Two and a half weeks later, Dr. Booth reached a level of 24 feet, and found more of the same skeleton – a thigh bone, vertebrae, and more charred wood. What is more, the remains were found resting on a layer of iron ore, which bore the impressions of coarse matting. One could still see the marks of criss-crossing fibers. What astounded Booth was that the layer in which both portions were dug up was the second or saccharoidal sandstone of the Lower Silurian – dated an incredible 425 million years old. Let me repeat that: 425 million years. We have gone far beyond the purported age of human culture, of man himself, the apes, all mammals, even the age of the dinosaurs. According to evolutionary theory, the Silurian age saw the advent of life on land and was in fact more than two-thirds of the way back to the supposed advent of life itself. But what are the remains of man and his products doing at this level? Something, certainly, is very wrong. Sir Arthur Stanley Eddington once wrote: “We have found a strange footprint on the shores of the unknown. We have devised profound theories, one after another, to account for its origin. At last we have succeeded in reconstructing the creature that made the footprint. And lo! it is our own.” There is more truth in this statement than first meets the eye, for there are many instances where not only did man leave his remains in the rock strata, but also his imprint. Among these, and others in nearby sites, Flint found examples of both barefoot and well-defined sandaled-foot impressions. All were geologically dated as being over 200,000 years of age. Now supposedly at this remote time, man was nothing more than a naked, hairy creature, capable of chipping a few flints and just beginning to overcome his fear of fire. In sharp contrast, the Nicaragua finds reveal the intelligent use of a walking stick, and the wearing of sandals that appear to have been best designed for both comfort and protection. We are confronted here with not just the footprint of a half-beast, but rather the footprint of a civilized being. Two years earlier, in the summer of 1882, inmates working in the quarry at the State Prison near Carson City, Nevada, brought to light a layer of sandstone covered with fossilized animal tracks, among them a number having belonged to the extinct mammoth. What caused considerable scientific consternation, however, was the fact that several human tracks were also found. The tracks were in six series, each with alternate right and left tracks. The stride was from two and a half to over three feet, and the individual prints were from 18 to 20 inches in length – that of a giant. The straddle – the distance between the lines of left and right prints – was 18 to 19 inches. Geologist Joseph Le Conte read a paper on the investigation done on the Carson City tracks to the California Academy of Science on August 27,1882, and attempted to explain them as the marks left by an extinct giant sloth that lived during the late Pliocene – over 2 million years ago. But sloths, in order to walk upright on only two feet, as the fossil tracks indicate, would have had to have used their tails as a balance, and there were no tail grooves in the sandstone. Not only this, but a comparison between the Carson City tracks and known sloth impressions showed several dissimilarities. The sloth’s prints have marked toe protuberances as well as definite claw marks; the Carson City tracks have neither. The Carson City tracks, in fact, showed signs that their maker had worn some type of sandal or foot protection – very definitely not the habit of an animal. The May 25, 1969 issue of the Tulsa Sunday World carried the story of a curious fossil find made on a hilltop overlooking the eastern part of Tulsa, Oklahoma. The find was made by Troy Johnson, a field geologist of thirteen years’ experience, and though he showed plaster-casts of his discovery to several experts, each and every one refused to accept it or its implications. Johnson had unearthed a sandstone strata filled with fossil tracks – many five-toed and distinctly human. The fact that a number of examples of these were overlaid by the tracks of now extinct creatures demonstrated that the mantracks could not have been of recent origin, but dated back between 3 and 5 million years. One remarkable mantrack find was reported in the Soviet journal (no. 8, 1961). In 1959, a joint Russian-Chinese paleontological expedition under the direction of Dr. Chou Ming Chen, discovered in the Gobi Desert of central Asia the fossilized print of a shoe with a ribbed sole. The find appears in sandstone dated at 15 million years. Members of the expedition who carefully examined the shoe-print were quick to recognize that it was not the footmark of any animal, for the ribbing was too straight and regular to be of natural origin. Even more recent examples of foot and shoe prints were brought to light in the 1970’s, in the Carrizo Valley in northwest Oklahoma. The prints occur in both the Morrison formation and Dakota sandstone – over 100 million years old. The bare foot marks are somewhat eroded, but show evidence of definite pressure ridges. Several are in very close proximity to dinosaur tracks. The shoe prints are more clearly defined, and reveal their wearers to have been above normal size, with the imprints averaging 20 inches long and 8 inches across the ball of the foot. Probably the most publicized mantracks are those found along the Paluxy river, near Glen Rose, Texas. They were first observed in 1908, after a flood washed away a portion of shore ledging, exposing geologic levels of the Glen Rose Formation, the Paluxy Formation, and the Twin Mountain Formation of the Trinity Group – all dated to the early Cretaceous, between 120 and 130 million years. Interestingly, these same rock types occur at Bandera, not far from San Antonio, and there, too, human prints have been uncovered and documented. On the Paluxy, serious research into the mystery of the fossil prints did not begin until 1938, when Roland T. Bird, of the Department of Vertebrate Paleontology of the American Museum of Natural History in New York City, removed a trail of brontosaurus tracks that were alongside a series of what his eyes beheld with the “official” position, but admitted in the May, 1939 issue of Natural History: “No man ever existed in the age of reptiles although the tracks are perfect in every detail.” Bird could only conclude that the prints he saw were those of some “extinct ape” – but this explanation was most unsatisfactory, since according to evolutionary theory, apes were not to appear for another 100 million years after the epoch of the brontosaurus. The Paluxy site became a tourist attraction, and during the Depression, locals began excavating both dinosaur and man prints, and selling them for souvenirs. Some of the specimens sold were really hand-carved by the more unscrupulous opportunists, and unfortunately in later years, conservative scholars were quick to point to these few examples of fakery as the answer to all the tracks discovered. But on-the-spot diggings by geologists and paleontologists have uncovered many new prints found in situ that could not have been hoaxes, for they were discovered deep within the rock layers, and at times several feet back into the Paluxy banks, where no fabrication could possibly be made. The sum total of finds along the Paluxy reveal quite a mixture of man and animal types having lived all at the same time. There are heavy brontosaur tracks, the talon marks of the feared Tyrannosaurus Rex, three-toed spoors of other dinosaurs – and the imprint of a saber-tooth tiger, which was supposed to have lived only a few million years ago, not in the era of the giant lizards. As for the human prints, many are found in series, popping out of the Paluxy banks in a very natural stride, then wading into the river bed. A good number of the prints are bare, with the large toe in particular clearly distinguishable; others show signs of the maker’s feet having worn some form of foot covering, like a moccasin or thin sandal. in one instance, in fact, the fossil print is so well preserved that the impression of the lacing on the moccasin is still visible. Some human tracks are of men of modern stature, with shoe sizes from 7 to 13; others are of children, whose prints are both proportionally smaller and shallower. Several more, however, are 1 6-inches, with not a few of men with 21 and 1/2-inch feet and a 7-foot stride – giants in the true sense of the word. But the out-of-place footprints go back even further in geologic time. The American Anthropologist, volume IX (1896), page 66, describes the finding of a perfect human imprint in stone about 4 miles north of Parkersburg, on the West Virginia side of the Ohio river. The track was 14 1/2 inches long, and was found embedded in a large stone. Though few specifics were given, one expert has calculated from the type of rock depicted, and its position on the river’s edge, that the track must be at least 150 million years old, according to modern geologic dating. In the late 1970’s, Dr. Rex Gilroy, director of the Mount York Natural History Museum of Australia, discovered a giant impress on Mount Victoria. One tentative estimate puts the track at 200 million years of age. One of the most remarkable tracks was found in Fisher Canyon, Pershing County, Nevada. On January 25, 1927, an amateur geologist named Albert E. Knapp was descending a small hill in the canyon, when he spotted the fossil laying topside up among a pile of loose rocks. He picked up the find, and took it home with him. Upon closer examination, Knapp was astounded to discover, “it is a layer from the heel of a shoe which had been pulled up from the balance of the heel by suction, the rock being in a plastic state at the time.” The shoe print was in a marvelous state of preservation – the edges of the heel were smooth and rounded off as if cut, and its right side appeared more worn than the left – suggesting it had been worn on the right foot. But what Knapp found really amazing was that the rock in which the heel mark was made, was Triassic limestone – 225 million years old – which runs in a belt through the canyon hills he had been exploring. The rock was later examined by an expert geologist at the Rockefeller Foundation, who confirmed Knapp’s analysis. The presence of minute crystals of sulphide of mercury throughout spaces in the fossil also testified to it being of great antiquity. It was not until 1930 that further and more detailed investigations were performed, this time by Dr. Wilbur Greely Burroughs, head of the geology department at Berea College. Dr. Burroughs discovered a total of twelve 9 1/2-inch mantracks and portions of others, and confirmed that they had indeed been impressed upon gray Pottsville sandstone dating from the Upper Pennsylvanian period -well over 300 million years old. “Of these, two pairs show the left foot advanced relative to the right. The position of the feet is the same as that of a person. The distance from heel to heel is 18 inches. One pair shows the feet parallel to each other, the distance between the feet being the same as that of a normal human being. Dr. Burroughs concluded that the prints were made by a creature that was exclusively bipedal. Most amphibians and reptiles are quadruped – there were no foreleg prints. And those that have been known to walk upright on their hindlegs, always do so with the tail acting as a tripod or “third leg,” to give balance. As Dr. Burroughs carefully noted, nowhere were there signs of belly or tail marks in the examined stratum. Furthermore, Dr. Burroughs and several of his colleagues performed a microscopic analysis of the mantracks, and based upon the grain count, established that, “the sand grains within each track are closer together than the grains immediately outside the tracks and elsewhere on the rock for the same kind and same combination of grains, due to the pressure of the creature’s foot.” The “creature,” they found, had exerted a weight pressure a little above that of a modern man. As the Science Newsletter of October 29, 1938 commented, no amphibian or reptile that size has been discovered in the fossil record that walked upright in the Pennsylvanian era. On an outcrop of greyish-blue crinoidal limestone about 200 feet wide and extending along the west bank of the Mississippi for 3 miles just south of St. Louis, are a number of mantrack impressions which a century ago could be observed during low-water stages. The early French explorers along the river were the first to note their existence, and ever since they have created a heated controversy. The first scientific observation of the prints was reported by Henry Schooleraft in The American Journal of Science (volume V), for 1822, and he described them as, “strikingly natural, exhibiting every muscular impression, and the swell of the heel and toes, with a precision and faithfulness to nature I have not been able to copy.” His colleagues dismissed the tracks as Indian petroglyphs, but Schooleraft was convinced of their natural origin: They had been impressed, he carefully noted, not carved into the limestone. Whoever had made them, Schooleraft also commented, had been of average size: The foot lengths were 10 1/2 inches; width across the outspread toes were 4 inches; and the heels were 2 1/2 inches wide. The American Antiquarian, volume 7, pages 364-367 (1885) gave the account of another find associated with the St. Louis footprints that is perhaps even more disturbing. Quoting from Priest’s “American Antiquities,” a particular set of tracks was described in detail. Then, “directly before the prints of these feet, within a few inches, is a well-impressed and deep mark, having some resemblance to a scroll, or roll of parchment, two feet long by a foot in width.” The squared impression was not a natural shape; neither were there scratch marks that would have indicated the patch had been carved. Rather, the evidence points to the parchment impression having been made when the rock was still in a plastic state – made at the same time as the footprints. What such a find suggests is that the prints’ owners were not only men, but were men with the intelligence to produce some form of paper sheet – and perhaps write upon it. But as if this were not enough of a mystery, the limestone in which prints and paper appear, is dated to the Mississippian age – 345 million years ago. Still more finds of prints plunge mankind “feet first” even farther down into the geologic column. In 1948, a shoe impress was discovered near Lake Windermere, England. As reported in the natural history journal The Field for that year, the impress had been made in Ordovician limestone – an unbelievable 500 million years old. Remarkable too is the finding that the print bears signs of craft and artistry: Around the edge of both the heel and the foreshoe are circular impressions which resemble tacking; while in the center of the sole and heel are faint decorations of linear and flower-like designs. Though the impression is somewhat distorted in shape due to fractures and crevices in the rock surface, a measurement reveals an extended length of the shoe of about 8 inches and a width of 31/2 inches. On June 1, 1968, an amateur rock hunter, William J. Meister, of Kearns, Utah was visiting nearby Antelope Springs with his family. The area, which includes the Swasey Mountains and the Cambrian Wheeler shale formation, is famous for its many fossils, and on this particular day Meister was on the lookout for fossilized trilobites and brachiopods – according to evolutionary theory, once among the oldest known living creatures. Meister broke off a rock slab, and, tapping its edge with a hammer, it fell open in two pieces, like the leaves of a book. To his great surprise, inside was a human sandal print, pointed in the toes, rounded in the heel, and with a squashed trilobite in the center of the sole. The sandal print measured 10 1/4 inches long, 31/2 inches wide at the ball and 3 inches at the heel. The sandal appears to have been well-worn on the right side – indicating it had been worn on the right foot – and the heel impression is deeper by one-eighth of an inch, characteristic of the weight distribution of humans on the foot. This particular find was later examined by Dr. Hellmut H. Doelling, of the Utah Geological Survey, and he found no irregularities or evidence of fakery – the print was genuine. On July 20th, Meister returned to Antelope Springs with professional geologist Dr. Clifford Burdick. Digging in the same locality, Burdick discovered another imprint in the Cambrian shale, this time of a child The print was 6 inches long, and the five toes were barely distinguishable, as if the child was wearing moccasins. Yet Burdick detected that the toes were spread out, indicating the child had only begun to wear shoes, which tend to compress the toes with age. The heel and arch were again well depressed, showing weight distribution, and a segment of a fossil was crushed in its middle. Burdick managed to find a larger fossil imprint, like Meister’s original, though the impression was shallower, and also unearthed a second child’s track, smaller than the first, with the toes broken off, but perfect in its other aspects. Later, a detailed examination revealed that the rock in which the prints were found was made of tiny layers, and where the foot-marks occur, the layers were bowed downward from the horizontal – demonstrating that weight had indeed, been pressed into the once prehistoric mud. But that “prehistoric mud” with its tell-tale prints, is now Cambrian shale – an astounding 600 million years old. And the fossils in the prints are trilobites – supposed to be among the earliest forms of life on earth. This time, we have literally hit “rock bottom” in the fossil record – and yet here we find the presence of man, and an intelligent, shoe-wearing man at that. How could he have “evolved” from simple life, when the Cambrian prints testify that he is as old as life itself? It is one thing to find evidence of human skeletal remains and footprints in the incredible past, but it is something else again to discover artifacts that prove the existence of advanced cultures in the strata as well. One of the characteristics of any high civilization is its ability to work metals. Conservative historians and archaeologists, who hold to the concept of linear cultural development, point to the ancient Middle East as the home of the very first metal production. Here, they claim, man began to melt and shape copper, iron, gold, and silver only 8,000 years ago. But unusual relics brought up from the depths of the rocky earth tell a different story. In 1826, a well dug near the Ohio river in north Cincinnati failed to produce water, but did produce the unexpected. From a level 94 feet down, a buried tree stump was brought to the surface which showed the marks of an ax. The marks were deep and well-cut, indicating the use of a sharp and durable blade. The suspicion that the ax had been made of metal was confirmed when, embedded in the top of the stump, an advanced oxidized wedge of iron was found. The layer from which the stump came was estimated to be between 50,000 and 75,000 years old – nearly 10 times the accepted age of the supposed first metal usage. A letter kept in the Archives of Madrid and dated 1572, records the account of the Spanish Viceroy in Peru and a strange artifact which came into his possession. In the year the letter was written, Indian miners removed from a subsurface layer of gravel a large conglomerate boulder, and broke it into pieces for easier disposal. As the mass shattered to the hammer blow, out of the center of it fell a perfect six-inch nail. The nail was later given to the Viceroy as a souvenir, who had it thoroughly examined, and verified its finding. The first mystery is that iron was unknown to the Peruvian Indians, so the nail did not originate with them. And the second mystery is that the rock from which the nail was freed was in the neighborhood of 75,000 to 100,000 years in age. In the June, 1851 issue of Scientific American (volume 7, pages 298-299), a report was reprinted from the Boston Transcript about two parts of a metallic vase dynamited out of solid rock on Meeting House Hill, Dorchester, Massachusetts. When the two parts were put together, they formed a bell-shaped vase, 4 1/2 inches high, 6 1/2 inches at the base, 2 1/2 inches at the top and an eighth of an inch thick. The metal of the vase was composed of an alloy of zinc and a considerable portion of silver. On the sides were six figures of a flower in bouquet arrangements, inlaid with pure silver, and around the lower part a vine, or wreath, also inlaid with silver. The chasing, carving, and inlaying are exquisitely done by the art of some unknown craftsman – yet this curiosity was blown out of solid pudding stone from 15 feet below the surface. Estimated age – 100,000 years. Unfortunately, the vase was circulated from museum to museum, and then disappeared. It is probably gathering dust in some curator’s basement, its identity or source long forgotten. Both sides of the medallion were marked with artwork and hieroglyphs, but these had not been metal-engraved or stamped. Rather, the figures had somehow been etched in acid, to a remarkable degree of intricacy. One side showed the figure of a woman wearing a crown or headdress; her left arm is raised as if in benediction, and her right arm holds a small child, also crowned. The woman appears to be speaking. On the opposite side is another central figure, that looks like a crouching animal: it has long, pointed ears, large eyes and mouth, claw-like arms, and a long tail frayed at the very end. Below and to the left of it is another animal, which bears a strong resemblance to a horse. Around the outer edges of both sides of the coin are undecipherable glyphs – they are of very definite character, and show all the signs of a form of alphabetic writing. In 1876, the medallion was presented by Professor Winchell to a meeting of the Geological Section of the American Association in Buffalo. There was much speculation, but few answers. One participant, a conservative historian, Professor J.R. Lesley, tried to explain the object as a “practical joke” dropped into a hole by a passing French or Spanish explorer. The professor even claimed to see the coin’s figures as the astrological signs of Pisces and Leo, and read into the glyphs the date 1572. However, Winchell countered with these arguments against such an interpretation: 1. By no stretch of the imagination were the figures and glyphs decipherable in terms of any known symbology or script. 2. Who, as a practical joke, would have dropped a metal object into a hole and known that someone several hundred years later would happen to drill at that precise spot (within a 4-inch tolerance) and find it? The odds would be phenomenal. And 3. There is the very real problem of explaining the accumulation of 114 feet of deposit over the buried coin. Having examined all the evidence, Winchell was convinced the coin had indeed come from this depth. It had not fallen into a hole in the past – the sediments drilled through were uniform and undisturbed. And the amount of sedimentation was not what would have settled in only a few centuries. In fact, recent calculations based on uniform rates of alluvium deposition and radioisotope dates for this region estimate an age for materials from just below a depth of 100 feet to be between 100,000 and 150,000 years. What conclusions can we draw about the mystery coin? A lost civilization once existed on the North American continent which worked in copper and other metals; possessed art and writing; attired themselves with crowns and other clothing; knew of and perhaps domesticated several animals including the horse; utilized acids for etching in a manner that is still not understood today; and perhaps the most disturbing, possessed forms of machinery for the cutting, rolling and processing of metal pieces. As a sidelight, the enigmatic coin was not the only item that came from deep levels in Illinois. In 1851, in Whiteside County, another well-drilling bit brought up from a sand stratum 120 feet deep two copper artifacts: What appears to be a hook, and a ring. Their age is thought to be the same as that of the coin – about 150,000 years old. On February 13,1961, three rock hunters – Mike Mikesell, Wallace Lane and Virginia Maxey – were collecting geodes about 12 miles east-southeast of Olancha, California. Geodes are spherical stones with hollow interiors lined with crystals. On this particular day, while searching in the Coso Mountains, they found one stone located near the top of a peak approximately 4,300 feet in elevation and about 340 feet above the dry bed of Owens Lake. The rockhounds took it to be a geode, but later found it was not, because it bore traces of fossil shells. The next day when Mikesell cut the stone in half, he nearly ruined a ten-inch diamond saw in the process, for it did not contain crystals, but rather something totally unexpected. Inside were the remains of some form of mechanical device: Beneath the outer layer of hardened clay, pebbles and fossil inclusions is a hexagonal shaped layer of a substance resembling wood, softer than agate or jasper. This layer forms a casing around a three-quarter inch wide cylinder made of solid white porcelain or ceramic, and in the center of the cylinder is a two millimeter shaft of bright, brassy metal. This shaft, the rock hunters discovered, is magnetic, and after several years of exposure never showed traces of oxidation. Also, surrounding the ceramic cylinder are rings of copper, much of them now corroded. 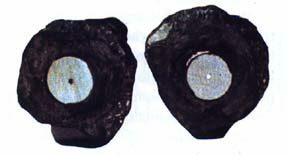 Embedded too in the rock, though separate from the cylinder, are two more man-made items – what look like a nail and a washer. EDITOR’S COMMENT: Several readers have stated that this artifact is indeed a spark plug from the 1920’s. The puzzled rock hunters sent their find to the Charles Fort Society, who specialize in investigating things out of the ordinary. The Society made an X-ray examination of the cylinder object enclosed in the fossil-encrusted rock, and found further evidence that it was indeed some form of mechanical apparatus. The X-rays revealed that the metallic shaft was corroded at one end, but on the other end terminated in what appeared to be a spring or helix of metal. As a whole, the “Coso artifact” is now believed to be something more than a piece of machinery: The carefully shaped ceramic, metallic shaft and copper components hint at some form of electrical instrument. The closest modern apparatus that researchers have been able to equate it with is a spark plug. However, there are certain features – particularly the spring or helix terminal – that does not correspond to any known spark plug today. The rock in which the electrical instrument was found was dated by a competent geologist at 500,000 years old. The rock strata appear to be full of metal “surprises.” The Illinois Springfield Republican reported in 1851 that a businessman named Hiram de Witt had brought back with him from a trip to California a piece of auriferous quartz rock about the size of a man’s fist, and that while showing the rock to a friend, it slipped from his hand and split open upon hitting the floor. There, in the center of the quartz, they discovered a cut-iron nail, six-penny size, slightly corroded but entirely straight, with a perfect head. the quartz was given an age of over one million years. In 1865, a two-inch metal screw was discovered in a piece of feldspar unearthed from the Abbey Mine in Treasure City, Nevada. The screw had long ago oxidized, but its form – particularly the shape of its threads – could be clearly seen in the feldspar. The stone was calculated to be 21 million years in age. Twenty years earlier, in 1844, Sir David Brewster made a report to the British Association for the Advancement of Science which created quite a stir. A nail of obvious human manufacture had been found half-embedded in a sandstone block excavated from the Kindgoodie Quarry near Inchyra, in northern Britain. It was badly corroded, but identifiable nonetheless. The sandstone was determined to be at least 40 million years old. In the fall of 1885, at an iron foundry owned by the sons of Herr Isidor Braun located in Schondorf near Bocklabruck, Upper Austria, a workman named Riedl was breaking up a block of Tertiary brown coal that had been mined from the pits at Wolfsegg, near Schwannstadt, and was about to be used to heat the foundry’s giant smelters. As the block disintegrated into several pieces, out dropped a strange cube-like object. In 1886, mining engineer Dr. Adolf Gurlt made a report to the Natural History Society at Bonn, Germany and noted that the object, coated with a thin layer of rust, is made of iron, measures 2.64 by 2.64 by 1.85 inches, weighs 1.73 Ibs., and has a specific gravity measurement of 7.75. Four of the iron “cube’s” sides are roughly flat, while the two remaining sides – opposite each other – are convex. A fairly deep groove was incised all the way around the object, about mid-way up its height. Other early studies on the iron artifact were in scientific journals of the day as Nature (London; November 11, 1886, page 36) and L’Astronomie (Paris; 1886, page 463). A plaster cast was also made before the turn of the century -important because the original object subsequently suffered from handling, and from being disfigured by samples having been cut from it by investigators for research. The cast is kept in the Oberosterreichisehes Landesmuseum in Linz, Austria, where the original object was also exhibited from 1950 to 1958. The iron cube is presently in the custody of Herrn O.R. Bernhardt of the Heimathaus Museum in Vocklabruck. In 1966-67, the iron “cube” was carefully analyzed by experts at the Vienna Naturhistorisehes Museum, using electron-beam microanalysis. They found no traces of nickel, chromium or cobalt in the iron – which means the object was not of meteoric origin. No sulfur was detected either, ruling out the chance of it being a pyrite, a natural mineral that sometimes forms geometric shapes. Because of a low magnesium content, Dr. Kurat of the Museum, and Dr. R. Gill of the Geologisehe Bundesanstalt of Vienna, are of the opinion that the object was made of cast-iron. In 1973, Hubert Mattlianer concluded from yet another detailed investigation that the object had been made from a hand-sculptured lump of wax or clay pressed into a sand base, this forming the mold into which the iron had been poured. The final conclusion, then, is that the strange object is definitely man-made. What is not explained is what it was doing encased in coal dating to the Tertiary – 60 million years old. On June 9, 1891, Mrs. S.W. Culp of Morrisonville, Illinois was shoveling coal into her kitchen stove when a large lump broke in two and out from the center of it fell a gold chain. The chain was about 10 inches long, made of eight carat gold, weighed 8 pennyweight, and was described as being “of antique and quaint workmanship.” The Morrisonville Times of June 11 reported that investigators were convinced the chain had not simply been accidentally dropped in with the coal: One portion of the coal lump still clung to the chain, while the part that had separated from it still bore the impression of where the chain had been encased. The Times could only comment, “Here is one for the student of archaeology who loves to puzzle his brain over the geological construction of the Earth from whose ancient depth the curious are always dropping out.” In this case, the “curious” “dropped out” of a piece of coal from the Pennsylvanian era – over 300 million years old. One more find that must be mentioned in the out-of-place metal category takes us – once again – to the deepest level of fossil life. On June 13, 1880, a reporter for the Inverness Courier named Walter Carruthers was vacationing near Loch Maree and Victoria Falls, in Scotland, and – being an amateur rock hunter – decided to explore the geology of the area. Between 300 and 400 yards above Victoria Falls, and immediately beside the last of the three lesser falls on the west side of the stream, Carruthers noticed peculiar impressions in the rock. The rock was a l6 x 16-foot exposed surface of Torridon Red Sandstone, placed in the Cambrian age. The impressions consisted of two continuous flat bands side by side, between 1 1/4 and 1 1/2 inches wide and about 1/4 inch deep, running unnaturally straight through the flat layers of sandstone in situ, and perfectly distinct for 16 feet, disappearing on the west side under the superimposed rock, and broken only where portions of the sandstone had been weathered out. A few weeks later the curious “bands” were also observed by a colleague of Carruthers, Mr. William Jolly, Her Majesty’s Inspector of Schools for the region. Carruthers had thought the impressions to have been the creation of some highly unusual living creature, but Jolly recorded that “the continuous even breadth and square section of the bands would seem to render this impossible.” Jolly further noted, “The double band resembles nothing more nearly than the hollow impression that would be left by double bars of iron placed closely together.” Jolly’s observation was corroborated years later when micro-specks of iron oxide were taken from the impression cavities. The superintendent thought, however, that perhaps the iron bands had at one time been inserted into the rock, “to clasp some structure to it” – but other findings discount this. First, the bands occur high above the Falls in an almost totally inaccessible place, where a “structure” would serve little purpose. Second, the bands are only one-quarter of an inch deep, so that anything “clasped” to them would not hold for long. Third, parallel on either side of each band are tin)? ripple marks in the sandstone, indicating the presence of the original iron bands had caused turbulence patterns in the sand during the time the sand had been laid down by water, and before it had turned to stone. Fourth, the sandstone in the impressions show tiny striations which are really the preserved grain marks of the iron – again, indicating the metal had been impressed in the primordial sand, before solidification took place. And finally, fifth, one portion of one of the bands bends back into the subsurface, and careful excavation revealed the presence of iron oxide totally encased by the surrounding sandstone. Jolly also found other band impressions in the same locality: There is a third band that runs alongside the other two, but is much less distinct and is not continuous. Two more lines, about 2 feet lower down on the rock surface, are only 7 feet long, and two more are higher up, running 3 feet long. Jolly also saw still more bands on an outcropping of the same sandstone on the other side of the stream, again parallel to one another – one 3 feet, another 6 feet, and smaller portions of several others. What purpose these iron bands served, we can only guess. What we do know, however, is that all the bands were very uniform in width and thickness, with squared edges, and the grain marks they left indicate they were rolled and cut – all of which points to precision manufacturing by machine production. But this is totally impossible, if we are to believe the geologists, for the sandstone in which the bands occur is Cambrian – 600 million years old, by their own measurements. Who, pray tell, was running an iron mill at a time when there was supposedly only tiny invertebrate creatures ruling the world? Metal-working is by no means the only sign of advanced culture: Other characteristics include such developments as art, architecture and writing. Since we have already observed several examples of metal production encased in geologic rock, it should be no surprise to find examples of other cultural elements also entombed deep within the earth. In 1921, an Arkansan named Rowlands was digging in one of the many gravel pits on a line of small hillocks known as Crowley’s Ridge, located two miles north of Finch. At a depth of 10 feet, Rowlands’ shovel suddenly struck something large and solid. The object appeared at first to be a boulder, but excavating around it, Rowlands soon discovered that it was a large rock-sculptured head of a man. It stood about 4 feet high, and the figure had a squared, protruding chin, small, tight-lipped mouth, a short nose, and a furrowed brow and stare accented by two flat “buttons” of inlaid gold for eyes. Two more gold discs ornamented the figure’s ears, and a heart-shaped plug of copper was embedded in the chest. The top of the head was covered by a carved hood that draped down the nape, and attached to a piece around the neck. Near the head, and in the same layer, Rowlands dug up a number of smaller objects: a gold ring, a small coffer made of volcanic pumice (which does not exist in this region), and tiny carvings of men, animals, moons and stars. The head and artifacts soon became a local attraction, and the newspapers dubbed the glowering figure “King Crowley.” Several investigators authenticated the find, though they could not explain its presence in the ten-foot layer of gravel – geologically dated at 175,000 years. The head and objects were sent to the Arkansas Natural History Museum in Little Rock. The museum curators, who also examined the artifacts and had double-checked and documented their discovery, were confident in the findings’ authenticity to place them on public display. At the same time, however, some of the small carving samples were mailed to the Smithsonian in Washington. The Smithsonian – being a far more conservative institution -described the carvings as truly “unexplained items,” but could not reconcile the antiquity of the strata in which they had been brought to light. Finally, after fifteen years of vacillating on the subject, orthodoxy triumphed: The Smithsonian concluded that the Crowley Ridge artifacts could not be 175,000 years old as this contradicted established theory on the age of human civilization, and therefore declared the artifacts fakes. Conforming to this prestigious conservative pronouncement, the Little Rock museum promptly took the stone head and other objects off display, and eventually sold them to unnamed private collectors. The “King Crowley” had was shipped off to California, and the rest of the collection was similarly scattered to the four winds. Today, the location of even a single object is unknown. One wonders how many other valuable out-of-place items, because they do not conform to “acceptable” schemes of history and geology, have been likewise thrown out or lost by Establishment institutions. Pate also discovered a form of mortar between the tiles. He believes now that the tile surface served as a common floor for several human shelters over a wide area. Delbert Smith, a geologist and president of the Oklahoma Seismograph Company, summed up the mystery concerning the tile floor in the Tulsa World of June 29, 1969: “There is no question about it. It had been laid there, but I have no idea by whom.” Yet another facet of the mystery involved the question of age. There are some differing opinions as to the geology involved, but the best estimate places the tiles at 200,000 years old. On August 1, 1889, a professional well-driller, M.A. Kurtz, was working near his home in Nampa, Idaho, along with two other crewmen, when their steam pump suddenly spat out a piece of brownish clay 11/2 inches long that was clearly humanoid in appearance. The discovery was also eye-witnessed by several prominent citizens of Nampa. What amazed these men was that the little clay “doll” had come from below a 15-foot layer of lava rock, 100 feet of sand, 6 inches of clay, 40 feet of more sand, then 165 feet composed of clay, sand, clay nodules mixed with sand, and coarse sand layers – a total of 320 feet. The small “doll” is composed of half clay and half quartz, and according to at least one expert, Professor Albert A. Wright of Oberlin College, it was not the product of a small child or amateur, but was made by a true artist. Though badly battered by time, the doll’s appearance is still distinct: it has a bulbous head, with barely discernible mouth and eyes; broad shoulders; short, thick arms; and long legs, the right leg broken off. There are also faint geometric markings on the figure, which represent either clothing patterns or jewelry -they are found mostly on the chest around the neck, and on the arms and writs. The doll is the image of a person of a high civilization, artistically attired. The Nampa doll came to the attention of Dr. G.F. Wright of the Boston Society of Natural History, who sought to verify the depth at which it was found – and thus also establish its great antiquity. In an on-location examination of Kurtz’s equipment, the hole drilled, and interviews with the witnesses, Dr. Wright became convinced the find was genuine. Kurtz demonstrated that the well had been tubed with heavy iron tubing 6 inches in diameter, so that there was no mistake about the occurrence of the artifact at the stated depth. Furthermore, the pump worked in only one direction – had the object fallen into the hole from above, it would have been destroyed by the pump. Wright concluded in a report to the Boston Society that, “There is no ground to question the fact that this image came up in the sand pump from the depth reported.” In another study, fellow Bostonian Professor F.W. Putnam found through microscopic analysis that quartz grains under the doll’s right arm had been cemented by iron molecules. This too – independent of the fact of the depth of the discovery – is indicative of a great age. How old is the Nampa object? The lava rock layer through which Kurtz’s drill penetrated is part of the prehistoric lava flows of the Columbia Plateau which occurred before the advance of the last Ice Age. And below this layer, the image was discovered another 300 feet down. The best modern geologic estimate puts the date for the layer in which the doll was found at over 300,000 years. Today, the Nampa doll is on exhibit at the Idaho State Historical Society in Boise. Curiously enough, a second doll-like figure was discovered sometime before 1880 near Marlboro in Stark County, Ohio, by workmen drilling a well. The image – made of black variegated marble and standing 6 inches tall – was unearthed from a depth of only 120 feet, but was embedded in sand and gravel of a similar type and age as that of the Nampa doll. There were two things remarkable about the Ohio figure: First, the marble it is made of is not indigenous to Ohio; and second, it bears an astonishing resemblance to the image found at Nampa. One can see in it the same bulbous head, simple facial features, stocky frame and long arms and legs. Did the two, the Ohio and Idaho “dolls,” come from the same enigmatic lost civilization? The evidence answers yes. One of the most convincing signs of a high civilization is the written word. In the early spring of 1891, a farmer named J.H. Hooper was examining a wooded ridge on his property, located in Bradley County, 13 miles from Cleveland, Tennessee. A peculiar stone caught his attention, which he first took to be a grave marker. But digging around it, he soon discovered that the stone was only a surface projection of a subterranean structure that extended into the depths below. Hopper spent the next several weeks in an attempt to uncover his unusual find: A length of wall, traced for a thousand feet, on the average 2 feet thick and 8 feet high, with numerous projections – like the first one – spaced along the top every 25 to 30 feet. The wall ran roughly at an angle of 15 to 20 degrees east. The structure continues on beyond the section exposed, in both directions, following the crest of a ridge that extends from the Hiawassee river north of Chattanooga southward, where it dips beneath the Tennessee river. Its position dates it geologically to near the beginning of the Quaternary – well over a million years old. The wall is composed of red sandstone blocks constructed in three courses, cemented together with a dark red clay mixed with salt, and in numerous places is plastered over with red, slate and yellow clays. Along one stretch of wall, near the northern end a distance of 16 feet, Hooper made without a doubt the most important discovery: Hidden beneath the outer clay plasterings, a number of the sandstone block surfaces were covered with the hieroglyphs of a lost language. The letters were arranged in wavy, parallel and diagonal lines, interspersed with small pictures of strange animals, many unidentifiable. there were other symbols too, of the sun and crescent moon, which appear to have some astronomical significance. All together, 872 individual characters were made out, many repeated – suggesting the script is a form of pictographic writing, like Chinese. Despite the implications of the wall, and the challenge of the discovery of an unknown writing, the find was met by the scientific community with overwhelming apathy. A short notice on the Tennessee mystery wall appeared in the Transactions of the New York Academy of Sciences (11:26-29), written by A.L. Rawson, who examined the structure and script first-hand, as well as published copies he had made of some of the glyphs and pictures. But that was all; no further study was ever made. In 1936, Tom Kenny, a resident of Plateau Valley, a town located on the western slope of the Rockies in Colorado, was excavating for a winter cellar to store vegetables, when at a depth of 10 feet his spade hit a barrier. Clearing the covering material away, he unearthed a pavement made of tiles, each man-made and five inches square. The tiles were laid in mortar, the chemical composition of which later analysis showed was different from all materials found in the valley. The perplexing problem is that the strange pavement was found in the same layer containing the three-toed Miocene horse – upwards of 30 million years old. In November, 1829, a block of marble measuring over 30 cubic feet was excavated from a depth of between 60 to 70 feet, from the Henderson quarry, located 12 miles northwest of Philadelphia. The block was sent to the Savage marble saw mill in nearby Norristown for cutting into slabs for construction. After taking off one slab about 3 feet wide and 6 feet long, workmen noticed something strange: They had exposed an unnaturally straight-edged, rectangular indentation. Several respectable townsmen were called to the scene, and in their presence the rest of the block surface was carefully removed. Revealed were two sharply defined engraved letters, resembling an “I,” and a “U” with a squared base. The indentations were 11/2 inches long and five-eighths of an inch in width. There was no way the letters could have been of recent origin – they were deeply embedded in the marble. More mysterious, the marble had come from a very old lime rock. Estimated age: About 65 million years. The Los Angeles News of December 17, 1869 printed an account supplied to the paper by a correspondent of the Cleveland Herald, writing from Wellsville, Ohio. The account described how in the autumn of the year, at a coal mine operated by a Captain Lacey of Hammondville, a miner named James Parsons was loosening a large mass at a depth of 100 feet, when he suddenly exposed a smooth slate wall covered with strange alphabetic writing. The letters were raised and well defined. The coal that had covered the wall bore their distinct impression – which means the letters date to a time when the coal was in a vegetable state, and had molded itself against the wall. Each sign was three-quarters of an inch in size, and arranged in rows precisely spaced 3 inches apart. The first line of letters contained 25. Local teachers and ministers examined the find, but could offer no explanations. Unfortunately, just before a number of university professors arrived to verify the discovery, the slate surface disintegrated from exposure to air, and the script was lost. Nevertheless, the find was well-documented, and attested to by several reliable witnesses. But the most disturbing fact about the mysterious slate wall and its glyphs was their undeniable presence in coal – coal from the Carboniferous era, well over 200 million years old. A naturalist named Isaac Lea reported in the American Journal of Science (volume I, number 1, page 155), in 1822, a find he had made in a stretch of sandstone located a quarter mile north of Pittsburgh, on the same side of the Monongahela river. Lea described it as the most singular specimen he had ever seen: An unusually flat rectangular surface, 3 feet long and varying from 5 to 6 inches wide. One end was cut off by a break in the rock – so there is no way of knowing the real length of the original impression. The other end terminated in the middle of the rock face in a straight, square line -as if a roll of paper had been torn off clean. On this flat surface were row after row of evenly spaced, perfect diamond shapes, each with an oblique, raised band across its center. Lea was mystified as to how to classify the impression, as belonging to the animal or vegetable kingdom. The answer is neither: The pattern is too precise to be natural, the diamond shapes too square to be designed by anything but an intelligent hand. Luckily, Lea had forethought enough to make accurate measurements and draw sketches of the impression, for when he returned to remove it for further study, he found that a quarryman had beaten him to it, and had done his work. The naturalist also took meticulous note of the position of the rock surface in relation to the geology of the surrounding area. The hill in which it existed is not high enough to take in the bed of carboniferous coal found in a horizontal stratum about 250 feet above the locality. In fragments of the impressed rock, Lea found fossils of primitive jointed plants – the type which made its appearance in the Devonian era, 400 million years ago. What exactly was the mysterious pattern in rock? We do not know, but the fact remains that it bore the artistic and measuring hand of man. That hand was contemporary with purportedly the earliest plant life on earth. How can this evidence of the presence of man from the very beginning of the fossil record be explained? Certainly, the prevailing Uniformitarian-evolution-linear model of the past is in no position to do so, because the mere existence of deeply buried human objects completely destroys the whole premise of slow, gradual, progressive development of the earth, of life, of man, and of human culture -the very cornerstone of the model. If man and his products can be found all the way down to the lowest level of geologic life, where is the evidence for his continual evolution, or for his long cultural climb from primitive beginnings? It is clear we must look elsewhere for the answers. Today, besides the Uniformitarian-evolution-linear model, there have been three new and alternative models proposed, and each of these offer their own interpretations of the past. These are: Extraterrestrialism, Catastrophic evolution, and Creationism. Let us look at each one separately. Most people have become aware of the Extraterrestrialist model through the writings of Erich von Daniken, author of Chariots of the Gods, and other similar works. What is not often realized, however, is that von Daniken’s ideas not only have had popular appeal to the man on the street, but they are having a definite impact on the academic and scientific world as well. Von Daniken offers what appears to be a plausible answer to the riddle of out-of-place artifacts of an advanced nature which have been unearthed from the archaeological record -and, as we have seen from the fossil and geological records as well. According to him, aliens from other worlds have supposedly been visiting the earth throughout history and prehistory, and the out-of-place remains we find were the product of contact between the spacemen and early man. In the case of those objects discovered in those layers believed to pre-date man’s appearance, then the items were left by the extraterrestrials themselves. By giving the out-of-place artifacts an “other world” source, Von Daniken has thus neatly explained their presence, while at the same time preserving accepted” theories of evolution. In effect, he has placed the artifacts in a realm outside the earthly scheme of things, where they do not conflict with slow, progressive evolutionary development – only intervening now and then. But there are several flaws in the Extraterrestrialist model. In not one instance has Von Daniken been able to demonstrate the existence of a single “ancient astronaut.” His “evidence,” on close inspection, is largely based on his own personal interpretations of primitive drawings and ancient records which look and sound (to him) like men wearing spacesuits, or riding around inside spaceships. In every case, there is another simpler and literally more “down to earth” interpretation for every “space” drawing and record he offers as proof. When we examine closely the out-of-place artifacts themselves, especially those we have studied embedded in the geologic layers, we find that they do not appear alien to us, and they certainly do not exhibit a technology exclusively different from that of, say, our own civilization today – that is, what man himself has and could have once before produced. What is more, where we have found the presence of artifacts, we have also found clear evidence of the presence of man: You will remember that among those discoveries made in the fossil record, not only did we observe objects of worked metals, stone, etc., but there were also human skulls, bones and footprints. Man was there; the artifacts logically were of his making. There is no need to invoke spacemen, or look to the stars, for an answer – the answer lies here on earth, or as in the case of our study here, in the earth. A second modern model of the past is Catastrophic evolution -and as its name implies, it is a modification of the old Uniformitarian-evolution model. Catastrophic evolutionists propose to fully accept the existence of human remains in the geologic column, while leaving the column and the dating of the various rock layers intact. What this means is a scenario of human history in which civilizations have been born, risen to intellectual and technological heights, and then were destroyed by earth upheavals, again and again over 600 million years. At first glance, this model might seem plausible enough to explain the facts. But there are problems to consider. As noted earlier, historians measure the antiquity of our own civilization as being no more than 10,000 years. If we take this as the average “lifespan” for the development of a technological society, and attempt to apply this to the multiple civilization scenario, we find that we must presuppose the existence of an incredible 60,000 civilizations to each down to the Cambrian age. What is more, there is the major difficulty of how all these societies would have disappeared -unless one is also to imagine 60,000 separate cataclysms. Unfortunately, the geologic record does not support that many world changes. The geologic record also reveals that, if only simple forms of life supposedly existed in the earliest levels, there was no way such environments could have supported a human population, let alone active civilizations. Finally, there still remains the unanswered question of where man originated – and for that, we have already seen, evolution cannot even attempt a solution. Our third alternative model to examine is by no means new – in fact it was the accepted model of the past long before uniformitarianism of geology came to the forefront. It is called Creationism, or Creation-Flood science, because it is based on the Biblical account in Genesis of the Divine creation of the world, life and man, and the world-destroying Deluge. What makes Creationism distinctive from the other proposed models is it teaches that mankind existed on the earth before most geologic strata were formed. What is more, he was created and lived as an intelligent, civilized being from the outset. The Genesis record describes how after Creation and before the Flood, the descendants of Adam – the Antediluvians – possessed an advanced culture that included agriculture, urbanization, the arts, metal-working and sophisticated engineering abilities. The Flood completely destroyed the Antediluvian civilization and the entire world, depositing the remains (according to Creationist-Flood geology) in a short time in the form of all the strata from Cambrian to early Tertiary. After the Flood, the first descendants of Noah built another civilization culminating in the technology that constructed the Tower of Babel. The remains of this post-Flood civilization, after the destruction of Babel, were swept away by the Ice Age disaster, and were preserved in the strata of the Tertiary-Pleistocene. The Creation-Flood model can thus accept the appearance of human remains and advanced artifacts in the geologic past, as evidence for pre-Flood and immediate post-Flood civilizations. Because of the cataclysmic nature of the Flood, and the abruptness with which the Babel-Ice Age disaster occurred, the Creation-Flood model predicts further that buried artifacts are probably few and far between, appearing as rare surviving remnants in the rock – which is the case exactly. The answer may lie in an uplift of pre-Cambrian rock located just to the southwest of Glen Rose. The uplift shows only small traces of the deposits which covered the Paluxy area, which means it could have served as a refuge for men and animals during the first part of the Flood. The waters appear to have retreated momentarily, and the men and dinosaurs climbed down from their summit, to cautiously walk across the mud-filled Paluxy region, probably in search of food. It is significant that all the Paluxy man prints are clear impressions of the whole foot, indicating that the stride of their makers had been slow and deliberate, and not running, as the impressions then would have been deep prints of the forefoot only. The tracks also go off in different directions, as if the survivors had split their company to search over more ground. But just moments after the impressions were made, the Flood waters must have returned, sweeping men and creatures away, and quickly burying their tracks by new deposits – deposits which aided in the perfect preservation of the prints to this day. 1. The Uniformitarian-evolution-linear model is totally inadequate to explain the presence of human remains in the geologic record, as these remains are in direct contradiction to the model’s premise of slow, progressive development from simple, primitive beginnings. 2. The Extraterrestrialist model is dependent upon the unproven existence of aliens from outer space, and rests on the false assumption that man himself could not have produced the out-of-place artifacts – even though they are in fact accompanied by human skeletal remains and imprints. 3. The Catastrophic evolution model presupposes the existence of a highly improbable number of destroyed civilizations to explain the buried objects, and cannot answer the basic question of the origins of man by evolution, since his remains are found as far back as the earliest fossil layer. 4. The Creation-Flood model offers a workable solution to the mystery of out-of-place fossil relics, which is also consistent with observable geologic phenomena based on a catastrophic premise. The model also explains similarities and parallels between out-of-place finds in diverse layers, which no other model can do. Based on these findings, then, we must conclude that the Creationist model is superior to all other models in supplying answers to the riddle of human remains and artifacts in the geologic record. These “strange relics from the depths of the earth,” in fact, testify to the validity of the Creation-Flood model, and tend to prove wrong the major concepts of all other models so far proposed. Allen, E.A. “Footmarks in Kentucky” American Antiquarian (1885) vol. 7. American Antiquarian (1885) vol. 7, 364-365. Bergier, Jacques Extraterrestrial Visitations From Prehistoric Times to the Present New York: New American Library, 1974. Berlitz, Charles Mysteries From Forgotten Worlds New York: Dell Publishing, 1972. Bible Science Newsletter July, 1970, p. 2. Binder,Otto O. Unsolved Mysteries of the Past New York: Tower Publications, 1970. Braidwood, Robert J. Prehistoric Man New York: William Morrow and Co., 1967. Brandon, Jim Weird America: A Guide to Places of Mystery in the United States New York: E.P. Dutton, 1978. Browne, J.B. “Singular Impression in Marble” American Journal of Science vol. 1, no. 19, p. 361, 1831. Chapman, Glen W. “Archaeological Findings of Pre-Flood Cultures in America” Bible Science Newsletter August-September, 1969. Chardin, Pierre Teilhard de The Appearance of Man New York: Harper and Row, 1965. Charroux, Robert Forgotten Worlds New York: Walker and Co., 1973. Charroux, Robert One Hundred Thousand Years of Man’s Unknown History New York: Berkeley Publishing, 1971. Corliss, William R. Ancient Man: A Handbook of Puzzling Artifacts Glen Arm, Md. : The Sourcebook Project, 1978. Corliss, William R. Strange Artifacts, 2 vols. Glen Arm, Md. : The Sourcebook Project, 1976. Donelly, Ignatius Ragnarok: The Age of Fire and Gravel, rev. ed. New York: Steiner Books, 1976. Edwards, Frank Strange World Secauscus, N.J.: Lyle Sturat, 1974. Fange, Erich A. Von “Time Upside Down” Creation Research Quarterly June, 1974. Flint, Earl “Nicaragua Footprints” American Antiquarian (1889) vol. 11, 306-311. Fort, Charles The Book of the Damned New York: Ace, 1941. Itao, Jude Studies of the Stratigraphy and Dating of Geologic Anomalies in North America and Europe Unpublished, 1975. Keel, John A. Our Haunted Planet New York: Fawcett Publications, 1971. Kolosimo, Peter Not of This World New York: Bantam Books, 1973. Landsburg, Alan and Sally In Search of Ancient Mysteries New York: Bantam Books, 1974. Le Conte, Joseph “Carson Footprints” Nature May 31, 1883, 101-102. Marsh, O.E. “On the Supposed Human Foot Prints Recently Found in Nevada” American Journal of Science (1883) vol. 3, no. 26, 139-140. Mooney, Richard E. Colony Earth Greenwich, Conn.: Fawcett Publications, 1974. Nelson, Byron C. The Deluge Story in Stone Minneapolis: Augsburg Press, 1962. Noorbergen, Rene (researched for by J.B. Jochmans) Secrets of the Lost Races New York: Bobbs: Merrill, 1977. Norman, Eric Gods, Demons and UFO’s New York: Lancer Books, 1970. Pauwels, Louis The Eternal Man New York: Avon Books, 1972. Pauwels, Louis Impossible Possibilities New York: Stein and Day, 1971. Pierce, Josiah American Antiquities and Discoveries in the West: 1835. Rehwinkel, A.M. The Flood St. Louis: Concordia Publishing, 1957. Sanderson, Ivan T. Investigating the Unexplained Englewood Cliffs, N.J.: Prentise-Hall, 1972. Silverberg, Robert Man Before Adam Philadelphia: Macrae Smith Co., 1964. Steiger, Brad Mysteries of Time and Space Englewood Cliffs, N.J.: Prentise-Hall, 1974. Tomas, Andrew On the Stones of Endless Worlds New York: G.P. Putman’s Sons, 1976. Tomas, Andrew We Are Not the First New York: Bantam Books, 1973.